There is little to rival the appearance of leather products. They look good and feel even better. Leather goods are extremely rugged but also tough to create. The material is resistant to needles and very unforgiving when it comes to making any mistakes. A single ill-placed hole can undo all your good work and become a very expensive, frustrating mistake. The smart solution is to invest in the best sewing machine for leather and we are here today to help take all the sting out of that buying decision. We’ll present 11 of the best sewing machines for working with thick fabrics ranging in price from very cheap to top-tier machines better suited for commercial users. There’s something for everyone here! Is A Leather Sewing Machine Really Necessary? In Summary: Which is the Best Sewing Machine for Leather? While sewing leather by hand can be rewarding, it’s also time-consuming and certainly not the easiest type of crafting. Buying a sewing machine is not strictly speaking necessary but it will certainly simplify things for you. If you have decided to work with leather using a machine, buying one that is specifically designed to deal with thick material is a must. If you use a standard sewing machine, the leather is likely to stick to the throat plate or presser feet. In the best scenario it will slow you down while the worst outcome is a hole in the leather ruining your project completely. Specialized leather sewing machines also tend to give you longer stitch length choices. This is essential for strong and secure seams. If you are in any doubt as to whether or not your existing machine will cope with leather, get some scrap leather and give it a try. Keeping a close eye on your thread tension is crucial. If you are using a regular sewing machine, it might try to stitch more tightly which can cause the thread to snap. Buying a machine specifically for working with leather will minimize this risk. It’s essential not to skimp on your needles. Leather is predictably hard on needles so make it a rule of thumb to start a fresh project with a new needle. It’s not worth saving a few cents if you end up spoiling all your hard work by snapping the needle, jamming your expensive machine and ruining your garment all in one go! Synthetic thread is generally better than cotton. Nylon and rayon are usually your best bets. In the case of your leather not sliding properly, some baby powder can be surprisingly effective. If you are looking to sew with leather, it’s highly recommended that you get yourself this awesome set of presser feet to make your life easier whatever machine you use. Before thinking about buying a new machine, honestly analyze your specific needs. Consider how you will use the machine and how much you have to spend. Buy the best sewing machine you can afford without overcommitting yourself. We will look now at 10 of the best sewing machines for leather reviews so that you can confidently invest in exactly the right machine for you. We cover a wide range of styles and price points so that whatever you are looking for, you should have plenty of solid options. Sailrite Heavy-Duty Walking Foot Sewing Machine 18.5 x 17 x 15 inches 55 pounds Domestic 2-Year Limited Warranty. We’ll kick off our top 8 sewing machines for leather reviews with a heavy duty, all-round workhorse from Singer, the highly respected 4423. With a durable metal frame and a stainless steel bedplate, this Singer is built for serious mileage. Although it’s heavy, it’s not particularly bulky so you’ll get the best of both worlds. Capable of an impressive 1100 stitches per minute (spm), this is not a machine for beginners. The extremely powerful 105-watt motor makes this raw power possible. You’ll get a wonderful automated experience with the 4423. The needle is threaded automatically just as the bobbin will wind with a single push of a button. The 1-step buttonhole is the easier of the two types generally available. If you want to make a small extra investment, this great set of presser feet will cover all your sewing needs and make light work of sewing with leather. With the Singer Sewing Assistant app – available for iOS and Android – you can enjoy answers to FAQs, watch some handy tutorials and pick up some great advice on sewing techniques. 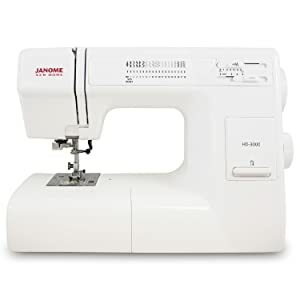 From making simple alterations to creating garments from scratch, the 4423 is a versatile powerhouse coming in at an extremely good price. If you want a no-nonsense machine capable of sewing leather without breaking the bank, the Singer 4423 should certainly be on your shortlist. When it comes to sewing with leather, many people recommend hand sewing to avoid the misfeeds that are common with many sewing machines. This advice is sound if you stumble in and buy any old machine but with Sailrite’s LSZ-1 you can sew with absolute confidence. This machine redefines “heavy duty”. You’ll be able to sew through up to 10 layers of canvas or 8 layers of Dacron fuss-free. When it comes to sewing leather, even if it’s thick from tanning, you’ll have no problems at all. As the name hints, this machine can also be used for making sails for boats. With straight and zigzag stitches available, you can make light work of heavy sailcloths made from Dacron. You will need to buy yourself a separate needle for leather. The needles provided will simply not puncture the material properly or stitch effectively so make the small investment and get yourself a great dedicated needle. The Sailrite comes with a patented Power Plus Balance Wheel. This is twice as large as a regulation flywheel and offers much more power. You’ll be able to sew at 500 spm. With the wide mechanical zigzag presser foot, you’ll be able to simply pull thick fabrics through in both directions with consistently strong results. For beginners through to proficient home sewers and sailmakers, the LSZ-1 is a solid and durable machine that will cope with the heaviest materials all day long. Another classic sewing machine from Singer next, the 9960 Quantum Stylist. With so many stitches, it’s great news that you can consult these on a handy reference chart on the machine itself. There are 18 presser feet, an automatic needle threader and an automatic thread cutter taking lots of work out of your hands and allowing you to focus on your crafting while the machine does the work. When working with larger projects, the extension table comes in very handy. If you want to monogram, you’ll be spoiled for choice with 5 attractive fonts available. With plenty of accessories thrown in and all major bases covered, the Singer 9960 will allow you to confidently work with leather without needing to hand sew unless you want to. For a fully automated and digitized experience, you really can’t go wrong with the 9960. It seems almost impossible to believe that so much can be delivered for so little. If you are serious about sewing, this machine should definitely be on your shortlist. 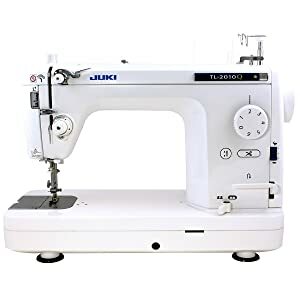 We’ll take a look next at a more expensive industrial sewing machine from the highly reputable manufacturer Juki. The DDL-5550 is not as versatile as some machines. It’s a single needle, straight stitch machine so if you want zigzags and more variety, this is not the machine for you. The speed needs to be seen to be believed. With an ultra-quiet 110V motor, you can stitch at up to 5500spm. This is far quicker than most of the opposition. For an industrial sewing machine that’s also perfectly comfortable in the home, take a good look at the DDL-5550. Think carefully about exactly how you intend to use your machine and, if your needs are simple, this is worthy of checking out further. Another great machine from Juki is up next, the TL-2010Q. This machine is slightly less expensive than the above model but still not ideal if you are on a tight budget. The Q is for quilting here and whether it’s ambitious quilting projects or working with leather, the Juki delivers in fine style. It should be noted that the straight mechanical stitch means that this is not suitable as an all-purpose sewing machine. Lots of sewing machines for leather are extremely complex but this all-metal beast is extremely user-friendly without compromising on quality. With 3 presser feet and 4 bobbins, you’ll have enough variety without being bewildered. The main selling point of this model from Juki is the exceptional stitch quality. Simply turn the dial for length adjustments while a basic slider tweaks the speed. Starting from 200spm, you can go as quickly as 1500spm. If you are looking for an all-rounder capable of a great deal without an excess of unnecessary stitches, the Tl-2010Q could be just what you were looking for. 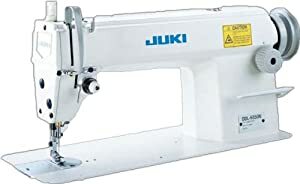 From beginners through to more advanced sewers, the Juki is a reliable workhorse ideal for sewing leather. 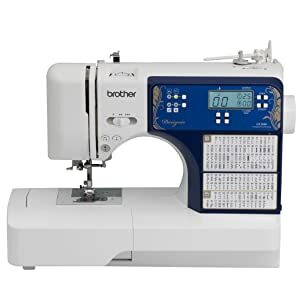 If you are in the market for a lightweight and portable machine that will also allow you to sew leather, the Brother CS6000i is a deserved classic. With 60 built-in stitches and 7 varieties of buttonhole using the simple 1-step method, you have a great degree of flexibility for a wide range of crafting projects. The LCD display is clear and easy to read. Selecting your stitch length and width is hassle-free. The drop-in bobbin is a cinch to load and jam-resistant for your convenience. You’ll get a free-arm built in so working with cuffs and sleeves is a breeze. A table lets you work comfortably on more substantial projects. It’s extra-wide and a nice bonus. The sewing area comes brightly lit so you can work without needing to squint your eyes. The CS6000i stitches at 850spm when at full clip. 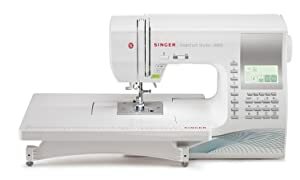 For a versatile sewing machine that’s computerized while still being straightforward to use, the Brother CS6000i is a wonderful choice if you want quality on a tight budget. 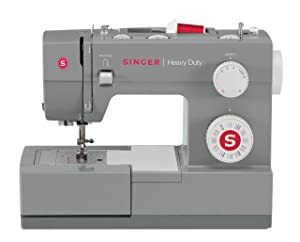 Our penultimate machine in these best 10 sewing machines for leather reviews is yet another Singer, this time the 4432. You’ll get 32 built-in stitches (6 essential, 18 decorative, 7 stretch, 1 fully automatic 1-step buttonhole) so that all your basic needs are covered without there being too much choice to confuse you. The metal frame is exceptionally strudy. You can sew at pace, even with heavier fabrics, with no skipping to ruin your project. It’s so durable that it can last for decades if properly maintained. The automatic needle threader means you’ll be up and running without fiddling around. For experienced sewers looking for a mid-range machine capable of sewing leather, the 4432 is definitely worth a road-test. Rounding out our reviews of the best machines for sewing with leather is another excellent model from Brother, the DZ3000. With a colossal 240 built-in stitches, 8 buttonholes available using the simpler 1-step method and 14 presser feet, you really do get a lot of bang for your buck with the DZ3000. The top thread and bobbin are very easy to thread. This machine is across-the-board extraordinarily user-friendly. The worktable is nice and wide so you can craft away on bigger projects without being cramped for space. If you want an advanced computerized sewing machine that copes well with leather but does not leave you baffled when it comes to operating it, look no further than the Brother DZ3000. This mechanical sewing machine has all the features you would want in a sewing machine. It has a top loading bobbin and automatic needle threader and bobbin system so you can get the job done properly and easily. Even though the machine has a plastic frame, many people consider this to be heavy duty because its internal frame is made of metal. This construction makes the device more affordable while still maintaining is sturdiness and durability. Like most mechanical sewing machines, this one does not offer plenty of stitch options. It only provides the user with 18 built-in stitch designs with 1-step buttonhole options. It also includes a free arm which allows you to make leather pants and sleeves. Moreover, the workspace of this sewing machine is wide and comes with adequate lighting to illuminate your sewing projects. I included this machine in this list simply because it has plenty of features that would come handy in sewing leather. For one, it has an extra high presser foot which allows the machine not just to accommodate multiple layers of leather but also provide enough space for the clips or binders you use for securing your fabrics. It also comes with easy-to-glide presser feet, and the best thing about it is that you can attach presser feet easily because of its snap-on feature. Last but not least, the machine is heavy so it can maintain its stability no matter how many layers of leather you will sew. If you are looking for something more affordable than the Janome HD3000, this is the best option that you have. It offers almost the same features as that of HD3000 but in a lesser powerful form. This heavy-duty machine offers 14 stitch options including 4-step buttonhole styles. It includes 4 presser feet along with a few bobbins and needles. This machine offers plenty of features that a beginner can take advantage of. For one, it has a built-in needle threader designed to simplify the threading process. It also has drop feed for freehand sewing and quilting of buttonholes. Lastly, its storage compartment is removable to allow you to enjoy free arm sewing. This machine is made of a cast aluminum body and is the second heaviest sewing machine in this list. This indicates that the machine is sturdy and will not shake or get disrupted when sewing heavy fabrics like leather. It has also earned the HD moniker because of its powerful 1.0 amp motor that is strong enough to sew thick fabrics at high speed. Moreover, it has an extra high presser foot lifter which allows the user to feed thick fabrics into the machine with ease. The machine features a 3-piece feed dog system which facilitates the smooth feeding of all types of fabric, even leather. 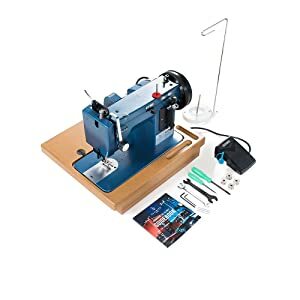 If you are looking for a cheap sewing machine for leather, this product should be at the top of your list. This is perfect for beginners as it is not only affordable—it is easy to operate as well. 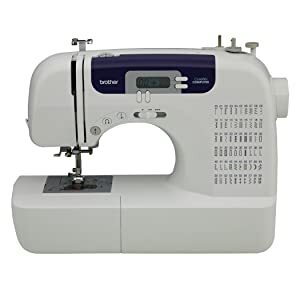 But don’t be fooled by its price, this machine is quite versatile and even provides the user with 37 built-in stitch options. Thanks to its dial control, you can easily select the type of stitch that you want to create. 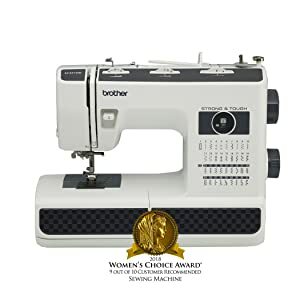 Just like most Brother sewing machines (even the basic ones), this machine has the typical Brother features including a jam-resistant top loading bobbin, automatic needle threader, and free arm. I included this machine in this list because of all the amazing features that it has. Let us begin with its metal needle plate feature (which is my personal favorite) that promotes easy gliding of the fabric to the machine. The machine also includes a few specialty needles. Among these needles, the best one that you can use is the #16 needle designed to sew heavy fabrics like leather. Moreover, the machine also comes with 6 versatile presser feet and extra specialized ones like the nonstick foot which glides over difficult fabrics (like leather) easily. It also has spring action zigzag foot which comes handy in sewing fabrics of various thicknesses. The leather is one fabric that would never go out of style. And that is why you would, at one point or another, have to deal with sewing this tough and tricky fabric. That would require advanced sewing skills. But more than that, you need a sewing machine that is specifically made for leather. This is the first question that you would have to answer when choosing the best sewing machine for leather. To answer this, you need to understand the key differences between the two. That is what we will talk about in this section. There are actually four main differences between these two machine types. The first point would be the engine. To be expected, domestic sewing machines have smaller engines and therefore, has lesser piercing power. The second difference is the type of needle that the machine uses. Obviously, industrial sewing machines use stronger needles which can make penetrating heavy and thick material to be as easy as possible. The third difference would be machine construction. Industrial machines are built for sewing leather all day long. With that in mind, here is our recommendation. If you have a business that concerns leather sewing, you may need an industrial sewing machine. But if you just plan to use your sewing machine for leather just from time to time, you can settle with a domestic sewing machine. Last but not least, the price ranges of these machine types are vastly different. With its more durable construction and a wider array of features, industrial sewing machines are a lot more expensive than that of domestic ones. Are you a home crafter who uses leather fabrics? If yes, how often do you use such fabric? If yes, you may go for a domestic sewing machine. Do you plan on experimenting with leather crafts? If you are and still don’t have any idea whether you will be working on leather in the long run, it is wiser to start with a domestic sewing machine then upgrade to an industrial sewing machine once you have made the decision. Do you plan on starting a home-based business with leather fabrics as your main material? If yes, you should go for an industrial sewing machine. Are you a leather product manufacturer or a tailor who is working on a commercial business or environment? If yes, then an industrial sewing machine is the best option for you. The rate at which the machine can sew the fabric matters. This is most especially true if you are an entrepreneur dealing with leather products. Of course, industrial leather sewing machines have a higher speed range of 1000 to 5000 stitches per minute. But please keep in mind that when it comes to dealing with heavy fabrics like leather, you must maintain a manageable speed so you can sew the fabric consistently and properly. The key here is to go for a machine with adjustable speed so you can customize the speed depending on the type of fabric that you will use. Heavy duty industrial sewing machines use a lot of power and are, therefore, not suitable for home use. If you are not careful in using this type of machine, it can blow up your monthly bills. In addition to monthly electricity bills, you also have to understand the fact that industrial sewing machines require lots of voltage to work and the requirement may exceed the electrical output in residential properties. If you plan to get a machine that uses a lot of power, you should hire an electrician to ensure that your source can provide you with the amount of electricity that you need. 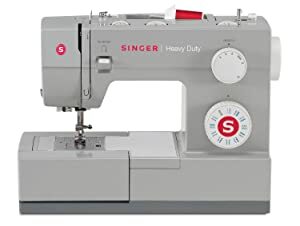 You can also go for sewing machines that come with convertible power sources that would make them suitable for home use. One thing you would notice about industrial sewing machines is that they produce more noise. If you use them in a factory, this won’t be an issue. But if you plan to use it in a residential setting, the noise level that these machines have can be disruptive for your neighbors. If this is the case, it is recommended that you go for machines with quiet motors so you won’t have to deal with any neighbor issues. These sewing machines use two types of motors—servo motor and clutch motor. The clutch motors are generally noisy, but it is used in dealing with thicker fabrics. On the other hand, the servo motor is a lot quieter but works best on light to medium fabric. Most sewing machines for leather come with two feed styles—puller feed and walking foot feed. Most heavy duty machine uses the walking foot feed. This feed moves up and down to support the feed dog and facilitate easy passing of thicker fabrics. According to experts, the walking foot feed is a lot easier to operate as compared to puller feed. Before you start making any purchase decisions, you need to ask yourself—how much can you afford? As mentioned, the industrial sewing machine is considerably more expensive than mechanical sewing machines. Of course, such expense comes with lots of benefits—more power, speed, and better durability. What is the machine made of? Is it made of materials that are built to last? Keep in mind that you are investing hundreds to thousands of dollars in this machine so you have to make sure that they can withstand wear and tear for a long time. Since you are dealing with thicker fabrics, you need a machine that is heavy. Go for ones that feature metal frame as such machines are created to last for long. We know how expensive some leather sewing machines can get and that is why it is important to make sure that your investment is properly protected. Lucky for you, most of the sewing machine manufacturers offer product warranty for their machines. Domestic sewing machines are often covered by a 25-year limited warranty while the warranty on industrial leather sewing machines is much shorter—2 to 5 years. Sewing machines greatly vary when it comes to the control features that they offer, so it is recommended that you familiarize yourself with such controls before choosing your machine. You must make sure that the control features are suitable for the skill level that you have. If you are a beginner, stick to basic features. If you are already an intermediate or expert sewer, you can go for fully automated or computerized sewing machines that offer plenty of advanced features. Never use plastic sewing machines for leather as these will tend to jump and shake which will cause uneven stitching and even, the destruction of your fabric. Go for heavier ones so it remains sturdy regardless of how many layers of leather you will sew. The hardest thing about working with leather is it such an unforgivable fabric. You can’t make mistakes when sewing them because it is impossible for you to fix them. After all, any marks of a needle or stitch are easily visible on leather. But the faster your machine is, the higher the risk of committing a mistake. But once you get the hang of it, you can already master sewing on fabric at high speed. The key here is to use a machine with speed control. Even if you are still a newbie, this feature can provide you with an option that you can use when you already become a better sewer. The size and lighting of your working space can have a significant impact on the sewing process and results. If you are dealing with larger pieces of leather fabrics, you would need a machine with a long arm (working table), so you can easily pass the fabric on the needle. If you plan to do precision stitching or quilting, work area lighting is of utmost importance. But if you are planning to create straight stitching, you can forego the lighting. Basically, sewing machine for leather uses 7 stitch types. The most common of which is the plain stitch. Other commonly used stitches are chain, overlock, and loc stitch. If you are planning just to create simple leather projects, these stitch types are already enough. You can also find other high-end sewing machines that offer as many as 600 stitch types. These would come handy for entrepreneurs who create complicated leather products. Most sewing machines with different types of presser feet. If you are already adept with sewing leather, the more presser feet that you have, the better! Leather has a sticky feel. Because of this, it causes friction between the leather and the presser feet, making it harder for the fabric to feed properly through the sewing machine. This problem can affect the quality of stitches that you will create. Using presser feet made of Teflon, silicone or another non-stick surface can solve this problem. And guess what? These feet are incredibly cheap! This type of presser foot works the same as that of the non-stick foot. This foot features textured rollers that can facilitate the feeding of fabric into the machine. If you are dealing with multiple layers of leather, this is the type of foot that you should use. The more powerful the motor is, the heavier it is. If you are going to use a heavy fabric like leather, mechanical machines will give you the extra punch that you need. Having the option to adjust the pressure of your presser foot allows you to achieve the perfect feed through your machine. This will allow you to accommodate multiple layers of thick and heavy leather under your foot. There are various types of sewing machine needles, each of which is specifically designed to work with different materials. The needle for leather is not like your standard sewing needle. Generally, leather needles are around 80/12 to 110/18 in size, and they have a unique point shape. Instead of spear or ball, it has a wedge point. This design helps to penetrate leather without tearing them easily. While the size of the needle is the reason why you can easily pierce through the fabric, it is also the main reason why you should be careful in sewing leather as it tends to leave a large hole in the fabric which you cannot cover up when you commit a mistake. Just like your needles, a typical thread will not work well on leather fabrics. For this type of project, you would need either polyester or nylon thread as these are a lot more durable and stronger. Never use cotton thread as it can react with the tannin substances of leather which will cause it to dissolve eventually. When you are sewing leather, the longer the stitch, the better. This is why it is recommended that you go for a machine with adjustable stitch length. The maximum length should be 3 to 4 mm. Any stitch shorter than that can cause perforation and tear of your fabric. Can you use a standard sewing machine on leather? Yes, you can. In fact, some people admitted that they use their standard sewing machine for their leather projects. But to do this, you would need to buy specialized accessories like leather needles, thread, and feet. And even with all these additional investments, you still have few concerns—weight of your machine and the power of your motor. If you just plan on creating leather projects for a few times, the upgrades will do, but if you plan on focusing on leather projects, it would be best if you will invest in a sewing machine that is specifically made for such purpose. Doing so can help you save time, money, and effort. It can also significantly improve the quality of your stitches. What are the best tips for sewing leather? Use binder clips instead of pins. As mentioned, pins can leave visible permanent holes on leather. The best and non-invasive way to keep the fabric in place is the use of a binder or fold back clips. To ensure that these clips will not leave a permanent mark on the material, try clipping your leather scraps first. You can also try using double-sided tape to keep the layers of fabric together. But be careful not to place the tape in the stitching line as the glue may get transferred to the needle. This can be problematic when you feed it to the machine. The only advantage of sewing leather is that it finishes no longer need special finishing. But If you want the leather to lay flatter, it is advised that you trim the side of the seam allowance. If you think that your leather is a bit high, you can reduce its height by hammering it a little. However, you should not forget to cover the fabric with a clean cloth before you strike it. Secure the ends with knots. You would usually secure the thread ends of common fabrics with backstitching. When you do this on leather, there is a high chance that it will get torn or perforated. With leather, it is recommended that you use knots instead. You should secure the start and finish of every stitching row with knots. How often should the machine have to be tuned up? How frequently do you use your machine? If you use your machine heavily in an industrial setting, you would need to tune it up more frequently—monthly or quarterly. Based on the condition of your machine, many technicians will have a recommendation as to when you should tune up your machine. The older your machine is, the more frequently it has to be tuned up. There are only a few sewing machines that are considered great for sewing leather and they are the products mentioned in this article. But which of these product is the best sewing machine for leather? 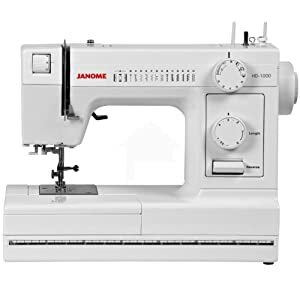 My pick would be the Janome HD3000 Sewing Machine because it has almost all the features needed to sew leather—high presser foot, heavy weight, metal construction, and powerful motor. In addition, its maximum stitch length is perfect for sewing leather. But what makes it a cut above the rest is its 3-piece feed dog that makes leather feeding as simple as possible.